Costa Bingo Bonus | Get Your £5 FREE Bonus Balance Here! Claim Offer – Get £5 Bonus No Deposit! Offer T&Cs: £5 bonus cash available only to 18+ new players who provide valid debit or credit card details. Offer valid until further notice. A wagering requirement of 8x bonus funds (£40) must be met prior to cashing out. Bonus funds valid for bingo games only. Max bonus conversion to cash capped at £100. General withdrawal restrictions & full T&Cs apply. Welcome Offer valid until further notice for 18+ non-funded players only. Minimum deposit £10. Maximum amount of tickets is fixed at 120. Tickets will be awarded to 4 specified rooms only, 30 tickets per room. Max 6 tickets per game. Winnings in real cash. Deposit balance is available for withdrawal at any time. General withdrawal restrictions & full T&Cs apply. 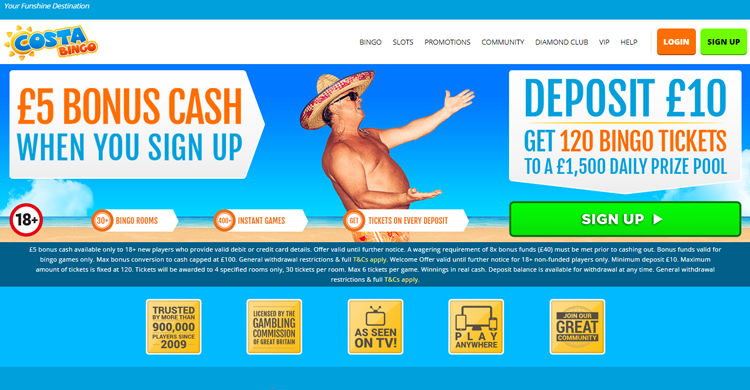 Costa Bingo is one of the eldest and most respected online bingo sites out there. Having established themselves as one of the best and most popular sites, they have got to such a privileged position by offering amazing bonuses and promotions to players. Perhaps the single biggest reason to join is that they will give you £5 completely free bonus without making a deposit. This is a no-risk offer, allowing you to get started playing bingo games and not spend a single penny of your hard earned money. As well as the £5 freebie, they will also provide you with 120 bingo tickets to a huge £1,500 daily prize pool when you fund your account with just £10. If all that didn’t sound like enough, Costa are famous for offering massive amounts of free bingo games. Simply check out the free section of the lobby and you will be able to play round the clock and win some super real cash prizes. £5 free bonus with no deposit required. Deposit £10, get 120 bingo tickets. Get further free tickets on your second and third deposits. Win jackpots up to £50 in one of three free bingo rooms. Extra free games when you deposit or reload your account. Powered by a customised version of Dragonfish software, you will find a great selection of 5 line, 75 and 90 ball bingo games. Tickets start from as little as 1p each, but if you are really hard up for cash, there are plenty of free games to choose from as well. There are some great perks for making your first deposit and reloading your account, including access to free games with up to £50 jackpots!. Another great selling point has to be the great jackpots. Perhaps the best game of the week is Costa Cooler which plays out every Saturday at 10 pm and has £3,000 jackpot. Plus you will also want to check out other top jackpot games such as Daily Night Fever, Costa Beach Club and Costa Fiesta, each playing out huge guaranteed prize pots. Slots players will also rejoice as there is a brilliant choice to choose from. You will find top titles such as Fluffy Favourites, Cleopatra, Shopping Spree, Bejeweled and many more. Some slots have progressive jackpot prizes of up to £30,000, so if you get luck you could be walking away with a seriously substantial sum. All things considered, there are very few things to criticise about Costa Bingo. The site is equally great for players on a small and large budget. You will find plenty of free and penny games, as well as large jackpot games and potentially rewarding slots. Add to that the fact that Costa is one of the largest, most respected and popular sites, you know that you are in safe hands. This is worth mentioning because with some sites you don’t know exactly how much you can trust them. Plus, if you haven’t forgotten, you will also get a £5 free no deposit required welcome bonus, and 120 bingo tickets added to your account when you first fund it with £10. Not a bad deal whatsoever! If already have an account at Costa Bingo, we recommend that you claim some free tickets at their sister site Sing Bingo instead.